Are you experiencing pain in the shoulder, elbow or wrist? Troubled by your upper limb? Upper limb problems are aches, pains, tension and disorders involving any part of the upper arm from fingers to shoulder. Upper limb disorders include problems with the soft tissues muscles, tendons and ligaments, along with the circulatory and nerve supply to the limb. They are often caused or made worse by work or sports. At Sportsmed, we believe that listening is very important. We listen to our patients, note their symptoms and take into account associated conditions. We then look, feel and move & carry out any special clinical tests; this gives us a better understanding of the problem. After physical examination, we investigate with the help of appropriate imaging techniques. Our old-school approach combined with new-age technical skills help us design an optimal treatment plan for our patients. The shoulder offers the largest range of motion of any joint in the human body. If your shoulder stops functioning normally, it can prevent you from participating in overhead sports or work. When the condition is more severe, it can affect even normal activities such as combing your hair, putting on your shirt and so on. 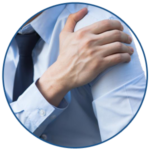 Commonly experienced shoulder problems include frozen shoulder, shoulder instability, calcific tendinitis, rotator cuff tears, ACJ dislocation, biceps problems, SLAP tears, impingement, AC degeneration, suprascapular nerve and scapulothoracic disorders. Symptoms experienced range from pain, stiffness and inability to move. For some patients, night pain can be highly troublesome and with sudden movements pain may intensify. The elbow is a complex joint formed by the upper arm (the humerus), the forearm (the radius and ulna) and an intricate system of ligaments and muscles, which connect the bones. Elbow injuries are common and can be extremely painful for both adults and children. Commonly experienced elbow problems include distal biceps rupture, ulnar collateral ligament (UCL) injury, medial epicondititis and lateral epicondititis. A few symptoms that one may experience are sudden pain with a snapping feeling and swelling or bruising. For a few, the biceps may appear to have rolled up in the arm. In partial (incomplete) tears, slowly increasing pain is felt with activities, and arm may feel weak. The pain often becomes nagging in nature, and may disturb sleep at night. The wrist joint is formed by several small bones (carpal bones) and ligaments, and a disorder of any one of these can result in pain and function loss. It is common to experience pain in the wrist. It is often caused by sprains or fractures from sudden injuries; also, wrist pain can result from long-term problems, such as repetitive stress (holding a heavy bat/ racquet), arthritis and carpal tunnel syndrome. Actions like turning a doorknob, opening a jar, holding heavy bat etc could aggravate the pain. In addition to pain, one mat experience clicks or catching in the wrist. Some patients have a sensation of weakness in the wrist and forearm. The entire forearm may feel weak. Wrist movements, and even grasping, can make the pain worse. As we've already seen that patients may face different problem with the upper limb, our treatment plan varies from one patient to another. The patient condition and symptoms determine the treatment that can vary from one or more of the following - lifestyle changes, exercise modifications, injections, surgery and alternative medicine. Every individual has a distinct lifestyle; unhealthy lifestyle may lead to upper arm problems. This may range from lack of physical activities or excessive usage of upper limbs for heavy-duty activities; a growing concern with young people is working for extended hours on laptops and excessive usage of handheld devices. Your doctor can help you identify a variety of lifestyle changes that promise better upper limb health. Additionally, we recommend physical therapy for strengthening your muscles and enhancing joint stability. A vast majority of our patients have tremendously benefited from physical therapy alone. At times, you may be recommended pain blockers and injections. Pain blockers provide temporary relief that ranges from a few days to couple of months. However, we use them very sparingly. Also, pain blockers tend to work better with younger people and older patients may not find them effective. To ensure that the injected substance reaches the exact problem area they are administered by our specially trained musculoskeletal radiologist, under ultrasound or CT guidance. Surgey is performed only if it is absolutely essential. At Sportsmed, we help you understand the pros and cons of surgical procedure and nonsurgical rehabilitation. Also, there is an optimal time for every surgical procedure; some have to be carried out early and others can be planned. Typical surgeries to address shoulder problems are - Arthroscopic Latarjet procedure, Mini-open Latarjet procedure, Arthroscopic Biceps Tenodesis, Arthroscopic AC joint repair, Arthroscopic rotator cuff repair, Arthroscopic Biological resurfacing (for Arthritis), Scapulothoracic endoscopy (for Snapping scapula), Sternoclavicular joint surgery, Shoulder replacement, Clavicle fracture fixation, Shoulder fracture fixation, “Popeye” biceps repair, Tendon transfers, Arthroscopic Bankart & Remplissage procedures and Shoulder Arthroscopy. Typical surgeries to address elbow problems are - Elbow Arthroscopy, Arthroscopic Tennis Elbow Procedure, Endoscopic Distal Biceps Repair, Mini-open Distal Biceps Repair, Arthroscopic Radial Head Excision, Ligament Repair and Reconstruction and Elbow Arthroplasty. Typical surgeries to address shoulder problems are - Wrist Arthroscopy, Arthroscopic TFCC repair, Arthroscopic Ganglion Removal, Arthroscopic Capsular Release, Mini-open Ligament Reconstruction, Suspensionplasty Procedures for CMC Arthritis, and Wrist Arthroplasty. You can discuss with your doctor which is the most suitable surgery for your condition. Alternative medicine does help in many cases. At Sportsmed, we believe in holistic approach to injury and pain management. Based on your conditions, your doctor may recommend osteopathy. Osteopathy uses a combination of movement, stretching, targeted deep tissue massage and manipulation of a person’s muscles and joints to improve function, relieve pain and aid recovery. We bring one of the finest osteopathy treatments from Australia. Our collaboration with Salt Health Solutions helps us bring the best of osteopaths to treat you in India.